Paper supplied to De La Rue bore the Multiple Crown Script CA (“Crown Agents”) watermark. It featured a stylization of the generic crown symbol used from 1902 to 1953 as the monarchy's official emblem. 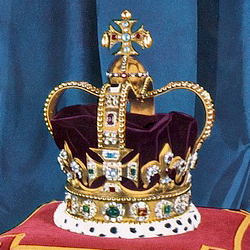 This is variously referred to as the Tudor Crown, King's Crown or Imperial Crown. The crown is accompanied by the letters CA in an artistic 'signature' script typeface that mimicked cursive handwriting and was harder to forge. The watermark was produced by Edwin Amies & Son. First a master plate was constructed in the form of wires arranged in a few iterations of the desired pattern and stuck on a small metal plate. This was used to make an impression on a block of wax. The wax surface was coated with graphite and wiped off, leaving graphite in the grooves forming the pattern. The block was immersed in copper sulphate solution, whereupon the graphite acted as an electrode on which metallic copper was deposited. The wax was then melted off leaving the watermark pattern in copper. Many such copper patterns were made and soldered onto a long cylinder of brass gauze called a dandy roll. The dandy roll was pressed and rolled over the still-wet paper to make the watermark. The gauze, with its fine and uniform grid, might have helped workers attach the bits with uniform spacing and helped drain excess water from the paper. 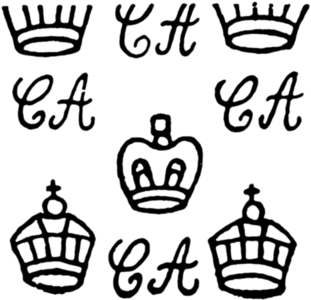 Much of the process above was documented in an auction catalogue in 2013, with the Multiple Crown Script CA watermark as one of the examples. Melville (1916) gave a different account of the first part of the process, saying that the crowns and letters were punched out of thin sheet brass or copper using steel dies. I am not sure which method was actually used. Perhaps both were used. Interestingly, the horizontal and vertical periodicities of the watermark are both slightly out of sync with the standard British Empire small-definitive stamp dimensions; the watermark repeats at slightly greater distances. Occasionally, the sheet was fed into the press the other way round, producing inverted watermarks (Peters 1994a) now highly sought by collectors. One night sometime between 1950 and 1952, the Crown Agents' Paper Inspector was supervising operations at the paper mill. Seeing that everything was in order, he went back to his hotel at 10pm (Faux 1986). But a mishap took place. 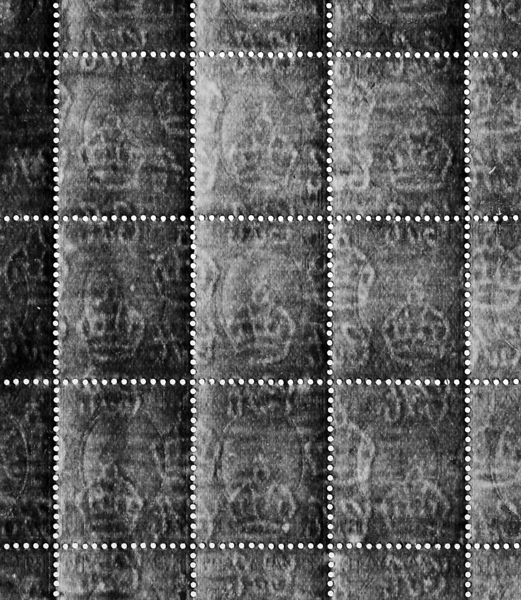 Two crowns fell off the dandy roll, one from a crown-CA row of the watermark pattern, the other from a crown-only row (Stanley Gibbons 1995). There are conflicting accounts of what happened next. Faux (1986) says that the mill was applying two different types of watermark concurrently, the Imperial Crown and the Saint Edward's Crown. The papermaker, discovering that crowns were missing from the Imperial Crown dandy roll, decided to fix it himself rather than wait for the engineer to come in next morning. He took replacement crowns from the wrong box. This chain of events seems unlikely to me. If it did happen between 1950 and 1952, QEII would not yet have asked for the crown to be changed, and there would not have been two types of watermark being applied. Furthermore, the 'wrong' crowns are different from those in the actual Saint Edward's Crown watermark, and have not been seen on any other occasion. Stanway (2009) says, more plausibly, that the replacement crowns were in fact "crudely made bits". But it does not look as if the worker made a crude imitation of the correct crown. Instead it seems as if he deliberately made a different design. It could have been easier to make than the correct crown, as there were fewer angular intersections and all it took was a few pieces of wire bent into shape. The precise circumstances will probably never be known. 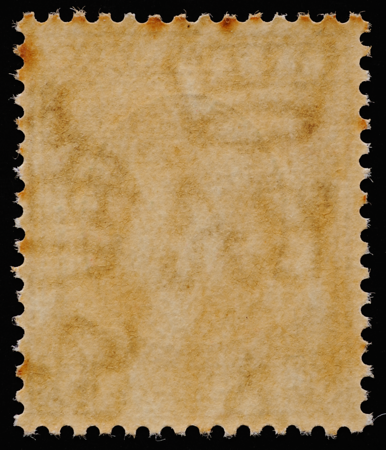 The end-product somewhat resembled the Saint Edward's Crown, and philatelists came to refer to the incident as the Saint Edward's Crown watermark error. Affected coconut definitives include the Johore 6¢, Perlis 10¢ and Singapore $1 and $2 (Peters 1994b, Stanway 2009, auction catalogues), indicating that these were printed together. Some issues of St. Kitts and the Bahamas were also affected (Faux 1986). The coconut definitive was one of the few that struck jackpot.